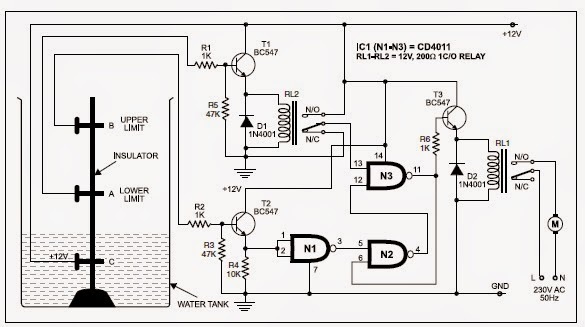 This is a simple schematic diagram of automatic water pump controller. The circuit of a water pump controller, as shown in the diagrag, comprises three npn transistors, all connected as emitter followers to present high input and low output impedance. Gate N1 of the quad NAND gate iC is connected as an inverter, while two other NAND gates N2 and N4 form a set-reset flip-flop controlled by outputs of NAND gate N1 and pole voltage of relay Rl2. The tank has a reference probe C, which is directly connected to 12V supply, while probe a represents the lower limit of liquid (any conductive liquid including normal drinking water) level. if liquid level falls below this level the pump motor must start and remain on until the liquid touches the upper probe B. When the liquid level falls below probe a level, transistor T1 is cut off and hence pin 13 of gate N4 (via N/C contact of relay Rl2) is at ground level. The output pin 11 of gate a therefore goes high. Transistor T3 conducts to energise relay Rl1 and the pump motor is switched on through its contacts. Once water touches probe A (but not the upper limit probe B), relay RL2 energises because of forward biasing of transistor T1, whereby pin 13 of gate N4 goes high. But its other input pin 12 is low as transistor T2 is not conducting. hence input to gate N1 is low and the logic output of gate N2 is low.